Our Media Centre is designed to give PR companies and journalists access to our latest news. Here you'll be able to download our latest press releases and any other useful information regarding the Institute of Water. To keep members informed, the Institute of Water publish a quarterly magazine which contains articles of interest and relevance to the industry, directly targeted at those within the industry. This gives members unparalleled opportunities to increase their knowledge about topics that are crucial to a successful future. The Institute of Water magazine is mailed direct to more than 2,200 Institute of Water members and subscribers; recipients include Managing Directors and Chief Executives of the Water Utilities and their suppliers, contractors and regulators – key personnel and decision makers throughout the water industry. The magazine offers the ideal platform to promote your company, services and business developments across the entire UK water sector. 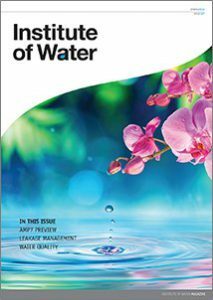 Each issue we cover a broad range of features to aid our members with their learning and development within the UK water sector and our members are also actively encouraged to contribute editorial content. Please contact Lee Hansom, PR & Communications Manager. Our magazines are available to view online here. If you are not a member of the Institute of Water but still wish to receive our Magazine, you can subscribe and have it delivered to you. The price to subscribe in the UK for is £40 and if you live overseas, the price is £60. Contact info@instituteofwater.org.uk if you wish to subscribe. Prestige: A great way to project your company or product. Profit: Brings your sales message to the most influential and significant buyers in the marketplace. Information: Offers businesses and manufacturers the chance to give the market a clear explanation of the state of your business, which is of great importance to shareholders, customers and suppliers. Introduction: Whether you are a new company, or an existing and established business, there are always new opportunities and potential clients. The Institute of Water Journal can help you reach them! Brand Awareness: Builds on your strengths within the marketplace by either building on recognised branding, or affirming your industry standing. Confidence: Creates the confidence among existing and potential customers. Image: Projects your company to the wider sector/business community and enhancing your reputation. To discuss advertising and editorial opportunities contact Martin Jameson or 07342 850289.